NOTE: There is a batch of product logo printed in white, other aspects of the headset have not changed, black logo and white logo are sent randomly. 1.Dynamic Driver Unit——High-quality vocal output provides you maximum listening pleasure. 2.CSR8635 bluetooth 4.1 chip——Ensures high-fidelity sound quality output for maximum acoustic enjoyment. 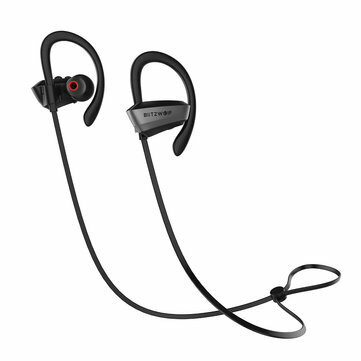 3.Ear Hook Earphones——The earbuds stay in place as you exercise and can be worn comfortably for long periods of time. 4.IPX5 Waterproof——Enables the product to be worn in rain or other wet environments. 5.Simultaneous Connection——The earphone can connect to two bluetooth devices simultaneously. 6.Long Working-time——110mAh Li-ion Battery lets you enjoy calling and music for up to 8 hours.